A versatile product that is both eye-catching and great fun. We loved the way in which the set was constructed so that it could be a theatre or shop and could be played full size or on a table top. It was instantly appealing and recognisable to the children. Both the shop and theatre are good for allowing children to role play and develop their story telling skills (and vocabulary) and they fostered a sense of pride as children wanted to share their play with an audience. The shop also provides the opportunity to develop numeracy and questioning skills. The theatre in particular is a good vehicle for building confidence in children as some children find it easier to talk and express themselves through a puppet, which promotes key personal, social and emotional skills. It also gives the opportunity for children to play out situations and make sense of them which develops their understanding of the world and how to manage emotions. Unfortunately the set was a little unsteady and did fall over a couple of times during play. Children love to perform and play shop, so what could be better than this multi-award winning toy that gives them both! The Fiesta Theatre and Shop is a colourful fabrics and wooden floor-standing theatre that simply turns around to become a traditional play-shop.On one side its a glamorous, colourful theatre stage, complete with high quality tie-back curtains, star-print front cloth and ruffled valance with detailed theatre-masks motif. On the other side is a bold red and white themed traditional shop front. Both the theatre and shop can be constructed as a table top theatre too. 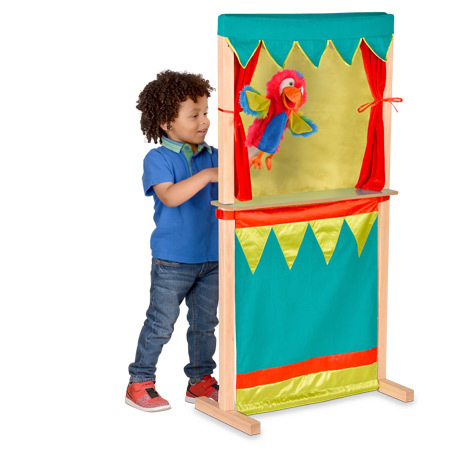 Equally suitable for boys and girls, it complements the popular Fiesta Crafts Puppets range. Popular in homes and schools around the world, both Theatre and Shop role-play help children develop their imagination, speaking and confidence skills and are not only adored activities but make a refreshing relief from screen-based activities. Easy to construct and after play, it stores very easily into its compact box with plastic carry handle. On the theatre side, the attractive stage area comprises of a wooden stage and curving satin backdrop that hides the performer so the audience is fully immersed in show! The curtains also open and close for the authentic theatre experience. Sturdy but light makes it easy for even a child to carry from room to room to instantly convert any space into a theatre, providing children, family and friends with the ultimate home entertainment centre. Of course, the theatre is perfect for Fiesta Crafts extensive range of hand puppets. On the shop side, the traditional red and white striped fabrics instantly creates a believable shop theme. Children love to play shopkeeper or customer and bring a whole new dimension to role playing games as well as developing important numeracy, questioning and even negotiating skills. Note that shop accessories are not included. By removing the lower section and reattaching the feet the Theatre or Shop can be used just as effectively on a table top giving even more possibilities for play. On trade bestseller lists and listed in The Times Onlines top 10 Christmas Gifts for Children, The Fiesta Crafts Theatre & Shop has won various awards: - Practical Pre School Silver, Good Toy Awards: Highly recommended; Bronze, ITSA (Australia).